Digital Guerilla – Sydney Web Design and Digital Marketing Experts » Cadbury UK ignore Facebook for launch of new product and go for Google+ instead! 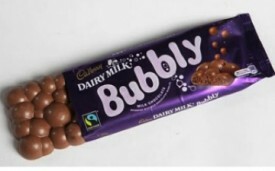 Yep, even though they have 77,000 fans on Facebook, Cadbury UK decided to launch there new product, the ingeniously named ‘Bubbly’ (nothing like an Aero obviously! ), on their Google+ page (2000 have them in their circles there) and then mentioned the launch on Twitter – ingenious, stupid or was there some hefty incentive? We’ll probably never know! Mashable reports that Christian Oestlein, the group product manager at Google known as the “Google+ ad guy,” also relayed Cadbury’s message on his G+ profile on Wednesday. It’s unclear whether anyone else has yet introduced a new product on Google+. Facebook became the go-to place for new product introductions after Ford launched its 2011 Explorer there in 2010. Does this mean Google+ brand pages will become the new choice of Social Media Marketing launches and teh big brands will move away from facebook (ooh controversial!)? Only time will tell, but it’s certainly a positive step in that direction for the new kid on the block. As we’ve said here before, ignore them at your peril!